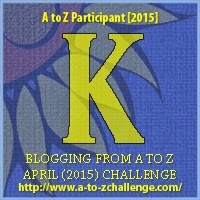 Maris Soule » Blog Hops » K is for K.I.S.S. Keep it Simple S***. (Here you can put Stupid or Sister or Son or whatever word that would start with S and fit.) I remember hearing K.I.S.S. way back when I started writing. It fits with query letters. A query that sticks to the basics (is kept simple) works best. No need to brag about your mother loving the book or how certain you are that this will be the next best seller. Simply tell the reader enough about the story to entice her (or him), say what genre you think it could be placed in, its length, if it’s finished, and why you’re the best one to write it. Applying the K.I.S.S. theory to the actual story may seem a waste of time, after all, if it’s a novel you have lots of words to use. Nevertheless, by trimming scenes so redundancies and repetitions are eliminated, your writing will become clearer. Focusing on the important aspects of a scene, rather than getting carried away with superficial descriptions or dialogue, will improve the story’s pacing and tension. Even with the plot, the K.I.S.S. theory works. You don’t want a story that’s too simple, but those with convoluted storylines don’t always work either. Rather than giving depth to the story, the divergent threads often lead the story astray. K.I.S.S. can be applied to web sites (too many bells and whistles often take too long to load or hide the real information), to blogs (stick to the point, don’t wander), and to biographies. Keep it simple. Don’t put anything out on the Internet that might come back to haunt you. Recently I read a back cover blurb for a self-published book. The blurb took up most of the back cover’s space and it told too much. It took me a long time to read it, and ended up convincing me I didn’t want to read the book. That’s definitely counter-productive. Tagged Blogs, Keep it simple, query letters, synopses, websites. Bookmark the permalink.